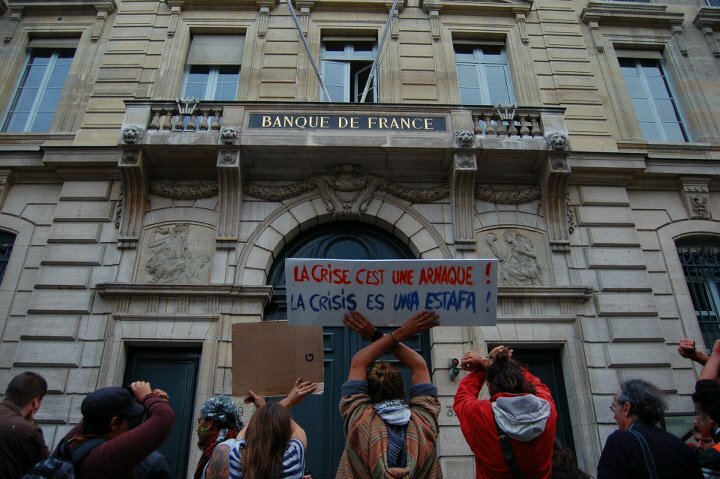 There was nothing more heartwarming than arriving in Paris this Friday to the confirmation that the indignados of Spain seem to realize this fact better than anyone else. The Bastille that night was a small carnival of cultures joining together to jam in the square and prepare for the big day of action against the banks the next day. 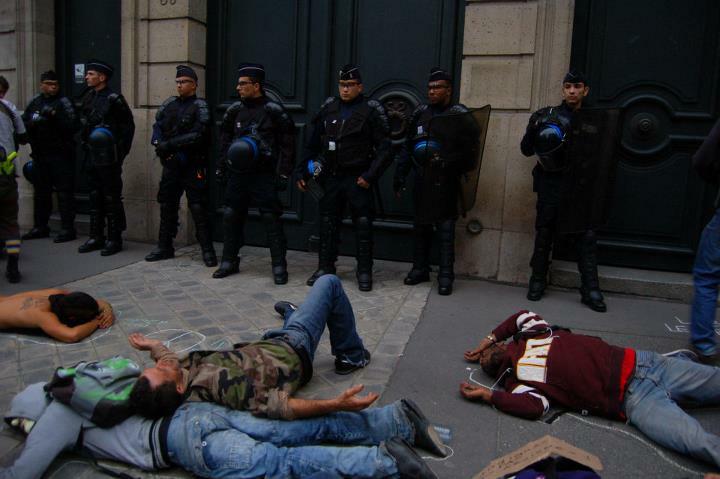 An army of riot police was present to prevent protesters from camping out at the highly symbolic site. At least thirty blue vans lined the humble group of 100 or so protesters. That’s when I realized how scared the authorities have become of us. After staying the night with Mariano and Anne, two lovely organizers who spent their entire evening with a team of volunteers preparing food for the welcome picnic the next day, we woke up to one of the biggest and most challenging days for the movement so far. 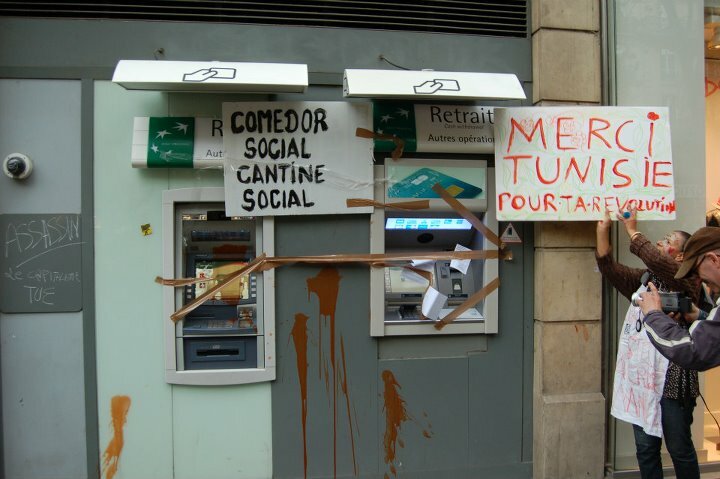 Up until now, the fall-out from the Spanish protests had largely been isolated to solidarity demonstrations. 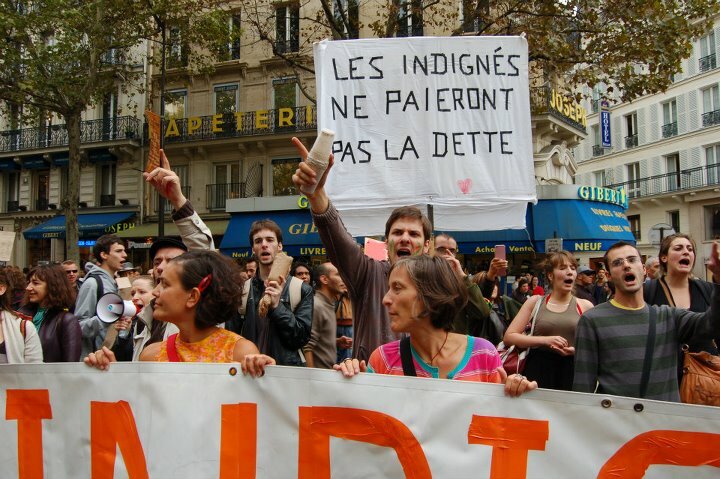 Apart from helping to inspire the movements in Greece, Chile and Israel, the indignados might have attracted a lot of international attention, but they remained a largely nationally-based movement. All of that changed yesterday. Next to the highly anticipated occupation of Wall Street, actions were held in San Francisco, Seattle, Toronto, Tokyo, Tel Aviv, Athens, Madrid, Barcelona, Milan, Rome, Amsterdam, Berlin, London, and numerous other cities around the world. 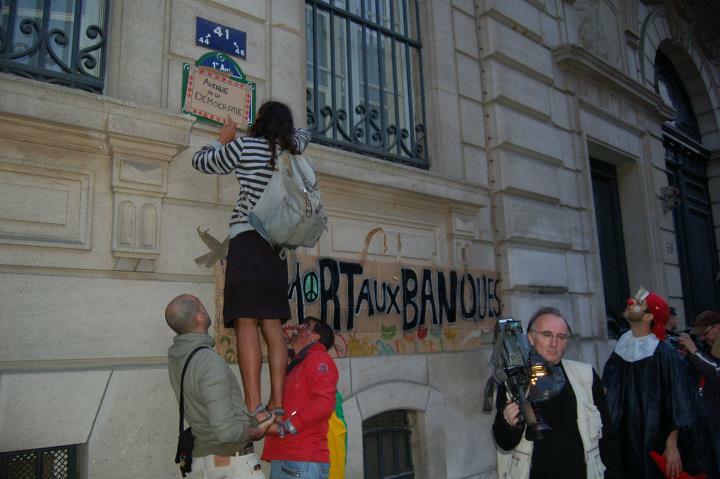 What is most exciting is that all of these actions were organized by local action groups, no longer just by Spanish expats. 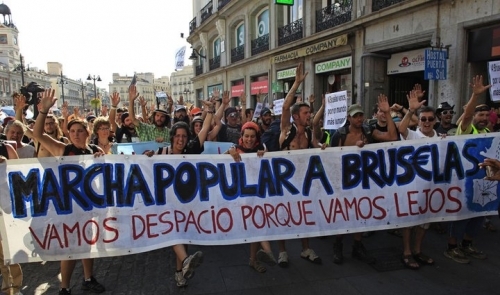 More than ever before, it has become clear that what began in Madrid on May 15 has now become a truly transnational movement with roots in every major city of the Western world. 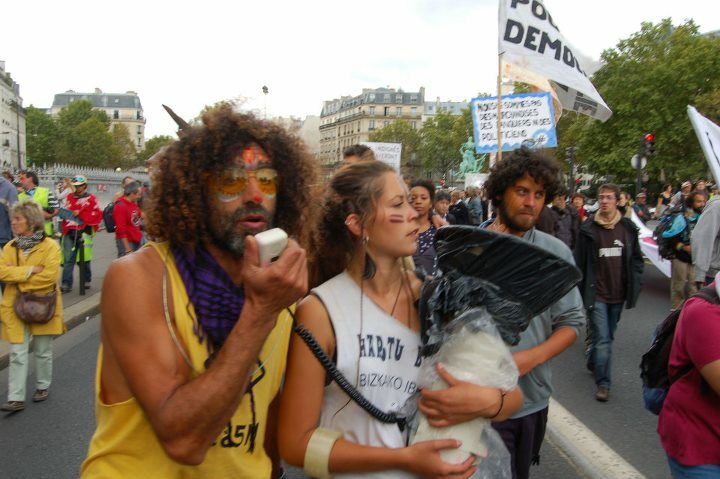 And so the march in Paris yesterday took on a radically cosmopolitan flair. 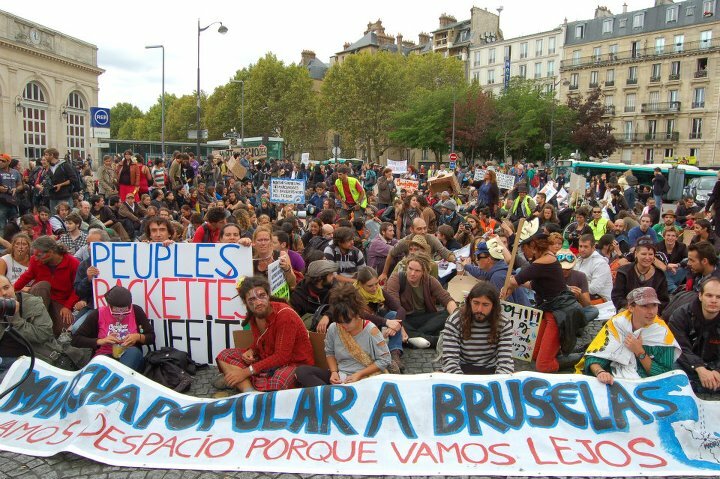 Not the cosmopolitanism of champagne socialists like Zapatero and Papandreou, but the cosmopolitanism of the street: radical transnationalism based on the belief that we can be united in our diversity — and in fact need to be in order to succeed in our objectives of securing a better world for all. 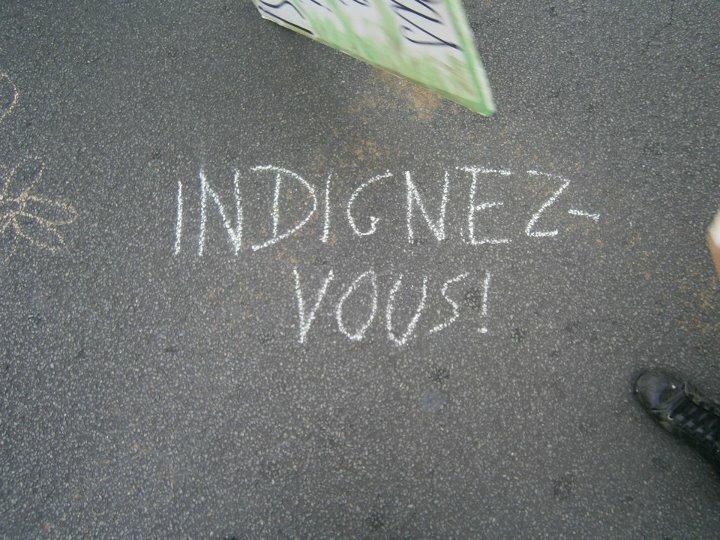 An extreme sense of positiveness and joy permeated the march as we walked down the streets chanting “indignez-vous, rejoignez-nous!” Even the Spanish-language slogans took on a universal character. 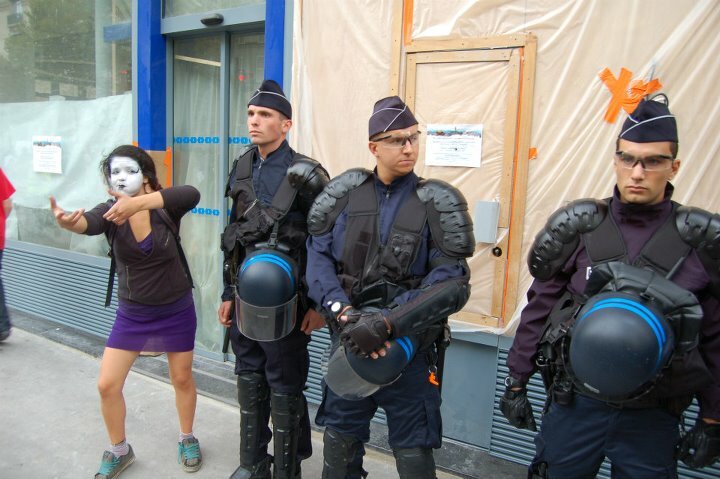 As always, the French police was omnipresent. 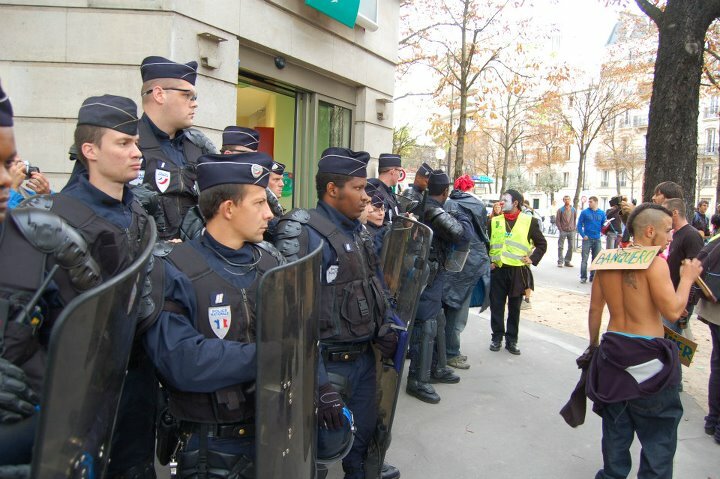 Afraid of even the slightest chance of an escalation, dozens of riot police constantly marched alongside us as we made our way from Cité Universitaire to Banque de France, and from there to the Bastille. 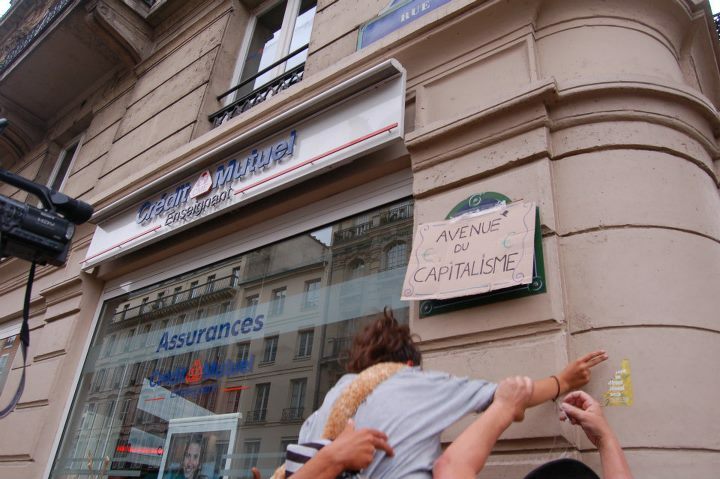 Every single time we passed a bank, the coppers would rally in front of it, forming a line to protect the retail arms of these corporate casinos from the innocent direct actions the indignados had planned for them. Once again, it became obvious where the allegiance of the modern state truly lies. 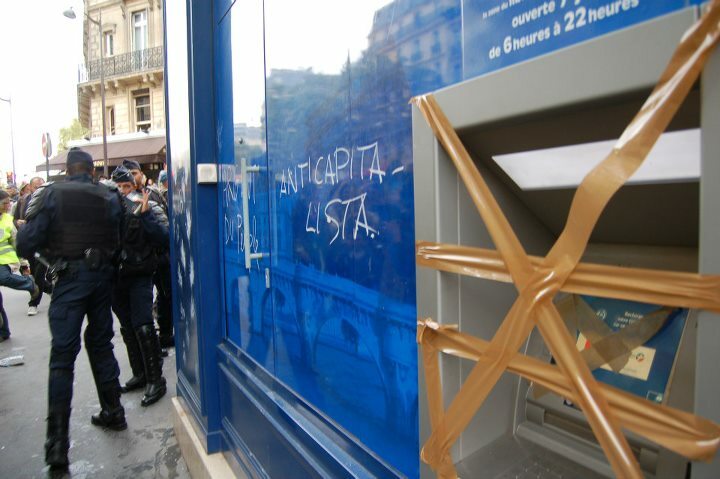 Apparently those in power still consider it more important to protect the banks from the people than the other way around. One of the most amusing moments came when the policemen realized they had to run from one bank to the next in order to stop us from getting there ahead of them. As they started jogging down the sidewalk, hundreds of marchers started running along with them to loud applause, screaming and laughing. For at least two minutes, a horde of people could be seen bolting down the streets chasing the police — a hilarious scene that, to an outsider, must have looked like the roles of oppressor/oppressed had briefly been reversed. Finally, the look on faces of the young policemen seemed to relax a bit as they realized they were making complete fools out of themselves. In the end, after a march that seemed to take ages, I still can’t conceive how the indignados actually managed to walk all the way from Madrid like that, always keeping a smile on their faces, making music and dancing, chanting their same old slogans with such joy and conviction, but throughout it all retaining a heart-felt commitment to radical social change and a revolution both in our minds and in our politico-economic power structures. Yes, much of it is very carnivalesque, and the more weathered activists among us may be skeptical about this, but if anything, the indignados have been more successful than any other movement in winning “the hearts and the minds” of the people. In the end, as the rain began to pour down, we arrived at Bastille to the warm welcome of a few hundred riot police who had completely blocked off the square. Dozens of blue vans lined the streets, their emergency lights reflected by the rainy Parisian cobblestones, suddenly opening their doors to unleash a wild herd of short-cropped blue buffaloes in full riot gear. Within minutes, the police managed to ruin what even the 1,000 mile march and the torrential rainstorm could not destroy: the festive atmosphere of this entirely peaceful protest. Rapidly, they formed a kettle around us, virtually sealing us off from the rest of the city. Hundreds of policemen surrounding a thousand protesters at most. Some of them carrying massive cannons for firing tear-gas canisters. I couldn’t help but wonder why, anytime the people take to the streets to exercise and defend their democratic right and duty to rise up against social injustice, they try to contain us, bottle us up inside their kettles, seclude and segregate us from the rest of society, annoy us with their stern faces and disrespectful words, intimidate us with their shoulder pads and weapons, refrain us from publicly airing our indignation at the current state of affairs. The only conclusion I can possibly come up with is that they fear us. Just like Ben Ali and Mubarak were afraid of their people, our own government is afraid of us. For we represent the future and they represent the past. They represent the problem and we are presenting a solution. Only by desperately clinging on to a world that’s slowly slipping away between their greedy fat fingers can those in power sustain the illusion of control. It will soon be at end. 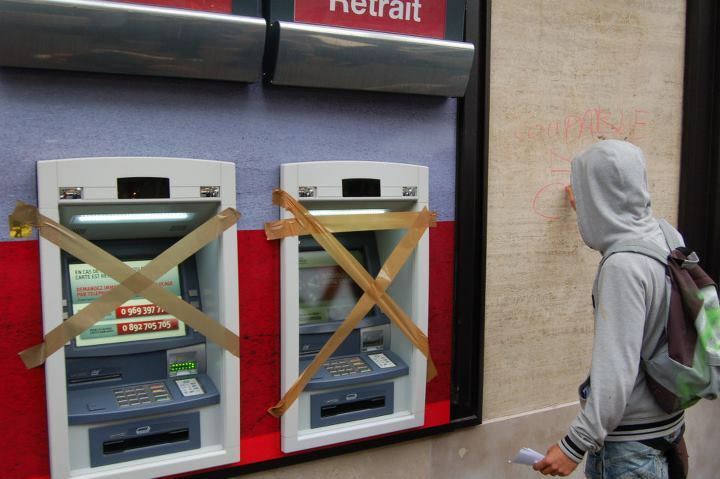 After all, it won’t be us who bring the French banks to their knees. At this pace, the banks will do that job for us. Out of their own voluntary greed. Their own shortsighted profit motive. Their own reckless casino games. 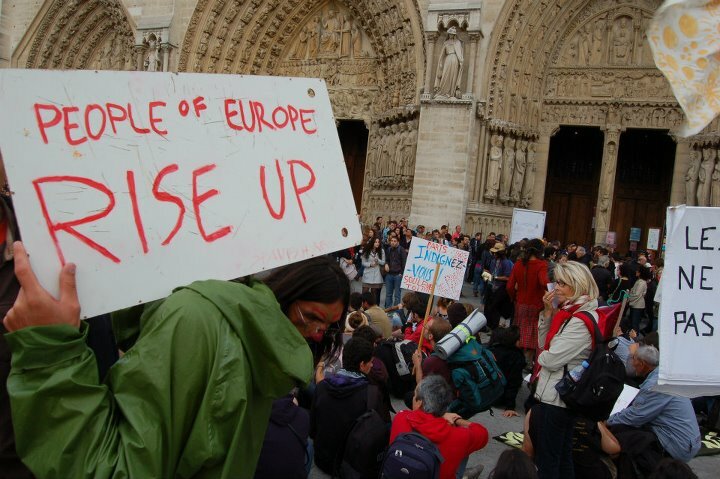 So, as the West marches headlong into its own collective financial suicide, we will continue to march for global change. 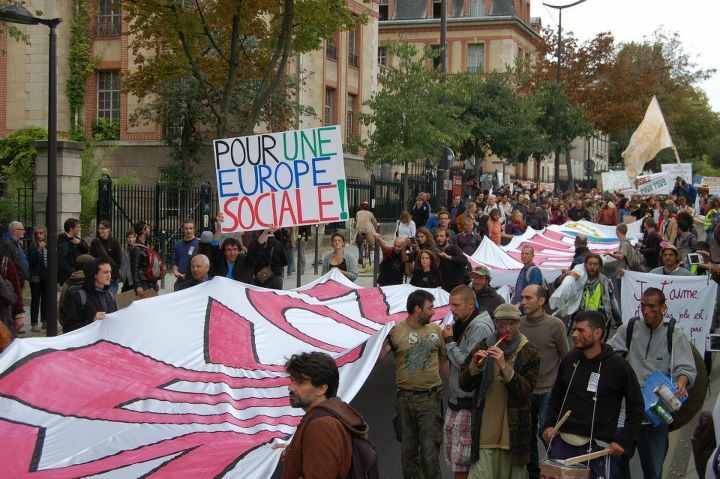 On October 15, you can expect us in front of the European Commission in Brussels. Surely we don’t have any illusions about what our marches will achieve. We definitely won’t change the world overnight — this process will take decades. But at least we’re well on our way. As the Spanish marchers like to put it, “we are going slow because we are going far.” How far? Who knows. Maybe we will march to Berlin to have a party on Merkel’s doorstep? Or Athens, to support our brothers and sisters in their attempt to overthrow the government and the austerity memorandum? Remember, whatever they may say (or not say) about the aims and achievements of our movement, this is only just the beginning.